Intel’s Next Unit of Computing (NUC) roadmap has been leaked, detailing future generations that’ll be powered by Intel’s upcoming Kaby Lake and Apollo Lake chips. NUCs powered by Kaby Lake i3, i5 and i7 processors will have TDPs of 15W, 15W and 28W, respectively. 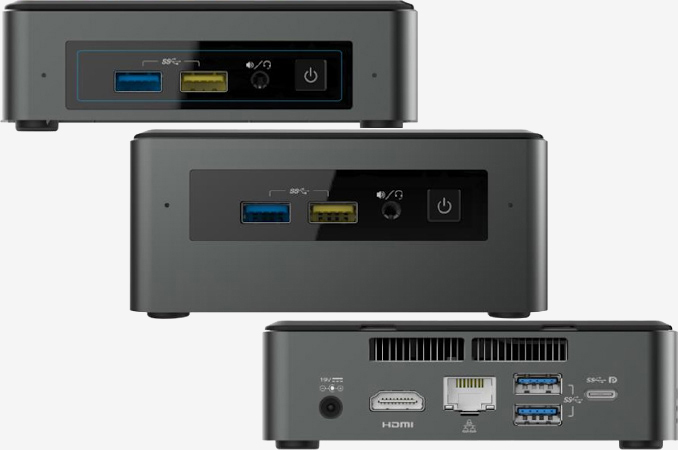 Codenamed Baby Canyon, these machines will also feature USB-C connectivity with Thunderbolt 3 and DisplayPort coming through the port. HDMI 2.0 will also be offered, allowing for 4K monitors at up to 60Hz. According to the roadmap, Intel plans to stick with its current Skull Canyon NUC through the end of 2017. Baby Canyon systems will arrive at the beginning of 2017 and perhaps fill the gap when Skull Canyon departs around 2018. Arches Canyon, meanwhile, should arrive by the fourth quarter of this year powered by Intel’s J-series Celeron chips. The slides detail two configurations – one with 2GB of RAM, 32GB of eMMC storage and Windows 10 Home pre-installed with the other being a barebones system that’ll support up to 8GB of RAM. Given the chip choice and lack of USB Type-C, this is obviously Intel’s entry-level offering. All systems will include built-in dual array microphones and come with a VESA mounting plate and a three-year warranty. As always, keep in mind that this is leaked information that may or may not be accurate although given the specs, they do appear to be plausible.